An F/A-18 D Hornet with unmanned aircraft software on board took over the plane’s controls like a zombie virus seizing the undead. 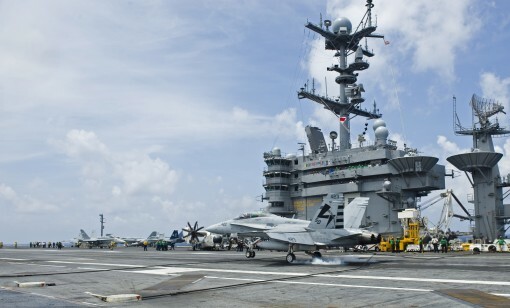 With the plane in its clutches, it safely landed the Hornet on the carrier Harry S. Truman. It essentially amounted to a hands free landing. The trap wasn’t as nefarious as a zombie invasion, but it may gobble up aviation billets – it was the latest test of the Navy’s drone technology used by the Navy’s Unmanned Combat Air Demonstration program. The technology was a version of the code that’s used on the X-47B that’s been reconfigured for testing on a Hornet. It’s the brains behind unmanned aviation, and instead of a pilot controlling the plane as it takes off and lands, a computer system takes over – hence the “zombie” monicker bestowed by the Scoop Deck’s 100 percent official, non-reversible authority. After the plane, which still had a pilot from Air Test and Evaluation Squadron 23 in the cockpit, landed, they did a few more zombie shots and traps. An F/A-18D Hornet makes an autonomous landing on the carrier Harry S. Truman to test out unmanned aviation hardware. // Navy Photo, MC3 Tyler Caswell. It’s not the first time that Hornet surrogate has operated on a carrier. Last July one made a hands-free landing on the Dwight D. Eisenhower. “Only 54 years ago!! !” he said.